Episode 90 is here with THQ’s lack of research. They could learn from others like Rep. Ocasio-Cortez. The Bourne Conspiracy follows the events of The Bourne Identity and adds a bit more to it to lengthen the game. You play just about every major and minor scene from the movie including the big car chase scene. That specific moment, however, is done poorly and is not all that fun. Luckily most of the game is beat-’em-up and shooting style of gameplay. There are opportunities for stealthy takedowns, but it’s not required and is the other part of the game that’s also not done all that well. Speaking of stealthy gameplay, Teenage Mutant Ninja Turtles 2: Battle Nexus on the Game Boy Advance is much better at it than the above game. It’s also much more enjoyable than TMNT 2 on the main consoles of its time like the PlayStation 2. You have to find crystals throughout the levels, but you have to use each turtle because each have different abilities allowing you to access places the others can’t reach. The difficulty of combat is fairly easy, but it’s welcome in this way since the traversal is what keeps you wanting to play some more. I finally got around to playing *the* Spider-Man game that gets all the praise since it’s 2004 release and that’s, obviously, Spider-Man 2. The praise is pretty much universally for the swinging abilities and it’s well deserved. But, that’s where it ends, in my opinion. The points needs to progress the story from menial rescues are very repetitive. I also didn’t enjoy most, if any, of the boss battles. I don’t dislike the game. I just wish it was as good as its reputation leads you to believe. 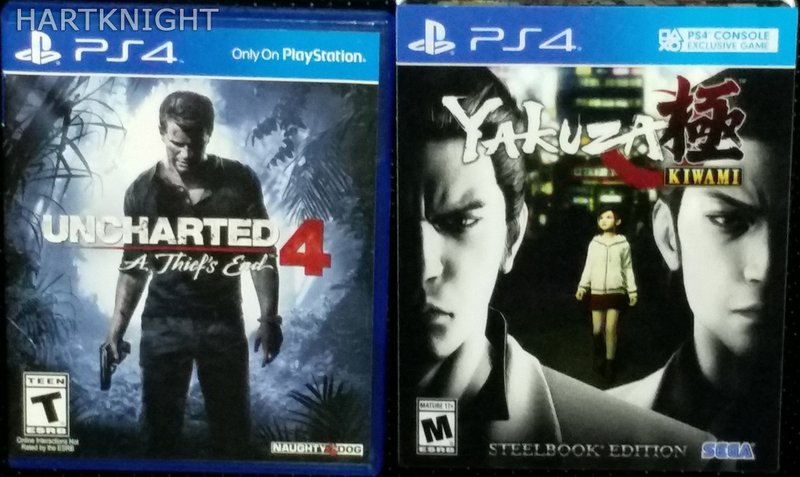 Of the four games I played in these last few months, Uncharted 4: A Thief’s End was the most fun. I liked the first two games quite a bit, and I still like them the most, but this game was a step up from the disappointment of Uncharted 3. Sam is a great companion and Sully’s dry wit is as welcome as always. The overall gameplay isn’t much different and that’s okay. It was good to begin with. Over the last few months the number purchases in the movie/TV and gaming realms I’ve made have been piling up. Here they are. Back in April I reported on getting a digital copy of Double Dragon II: The Revenge via Hamster’s Arcade Archives. Well, this time I also added the original arcade version of Double Dragon. This was one that Usagi704 also picked up and said I’d probably like how it turned out. Lately I’ve been afraid that the Yakuza games, despite getting a wide release in the West, would dry up sooner than you’d think. It seems to already have happened to Yakuza 0. I didn’t want to miss out on Yakuza Kiwami so I got it and I will be looking to get 0 soon enough. A used copy of Uncharted 4: A Thief’s End ran me around $20. I was on my wish list long enough and got it along with a unreleased game set to me sent to me in about eight days. Onto the movies/TV side, speaking of “unreleased” WWE released a 3 disc set of matches spanning from 1986 to 1995 called Unreleased. It has some decent matches with the two featuring Ric Flair against Roddy Piper and Hulk Hogan being quite fun to watch. I also popped huge for seeing Sean Mooney (who?) in the hosting segments. I bought and watched Guardians of the Galaxy Vol. 2 and it was fantastic. Yeah, it was another lackluster villain who posed no real threat despite being told otherwise. However, we’ve come to expect the main characters to be fun and relatable and that’s what we got. 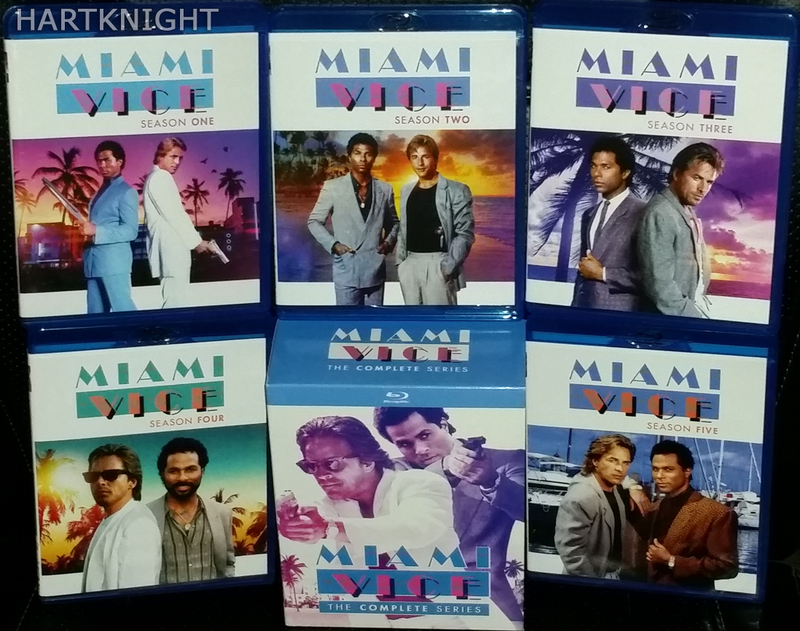 A staple of ’80s television was Miami Vice and on a whim I picked up the whole series on Blu-ray despite never really watching it at the time. I mean, I wasn’t even a teenager during its five season run. It’s a huge 20-disc set and was half the original price. 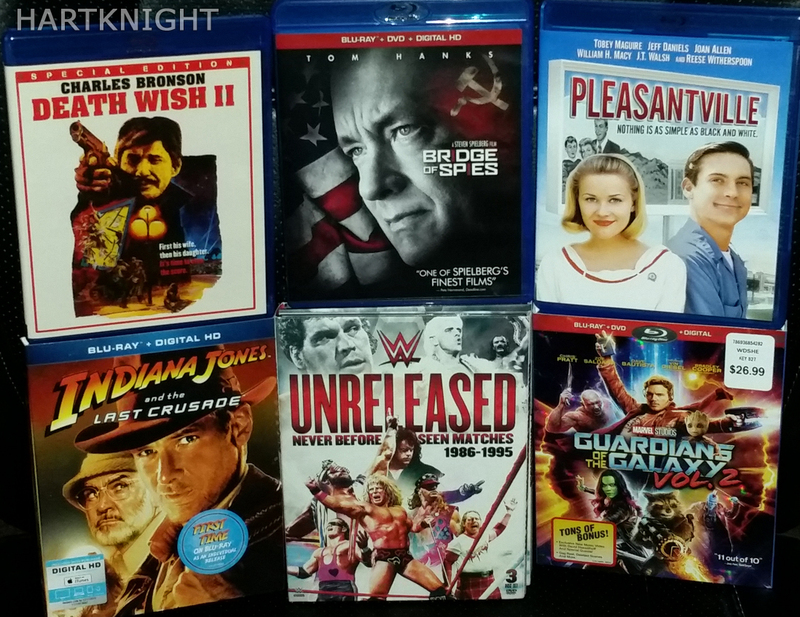 Other films I bought were Pleasantville, Indiana Jones and the Last Crusade, Bridge of Spies, and a special edition of Death Wish II with a theatrical and unrated cut of the film. 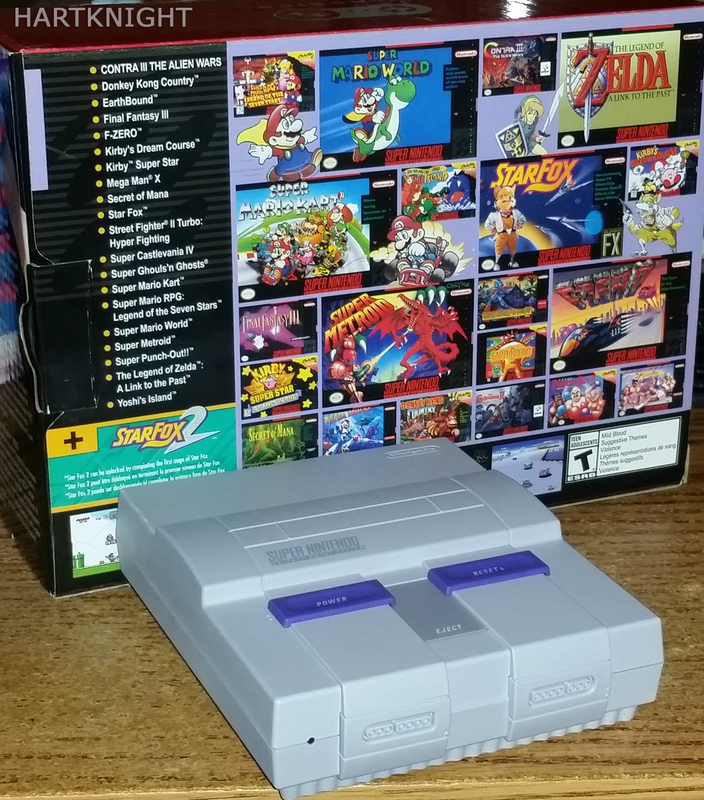 On a final topic, I can happily say that the SNES Classic was much easier to obtain than I expected, but it definitely was still on the low end of the quantity of the shipments. The store I work at received only 14 units which was more than the 2-3 they got last year with the NES Classic system. I helped sell an initial 6-7 at midnight, I immediately went on my break and bought mine. A first shift employee asked me if any were left and at 4:30am I sold the last one to him. It might not sound like much, but with just over four hours that supply lasted longer than I expected. As far as my experience with the system itself, I’ve only played Street Fighter II Turbo and even did so with Usagi704. It was as fun as a real system and I can’t really complain about the selection of games. Even if some of the games aren’t my speed, it’s understandable why they’re on there. Plus, the quality of the games chosen are of much higher quality than the NES Classic had. Truly less is more in this case. Thanks for reading and game on! The list below shows every game that I finished in 2016. The total number comes to only 13. That’s down 9 from 2015. The highest month was January with three games finished. The monthly average throughout the year was 1.08. A brand new episode of the Hart & Usagi Podcast is here! We chat about a variety of topics like the Nintendo Switch, The Last Guardian, Mafia 3, and more. Since I never did a Now Playing article for either February or March thanks to my PC being out of commission, I figured I’d do one for April. Why a week sooner than I’d usually aim to do it? This is because I don’t see myself having much time or interest in gaming in the coming weeks. My free time is more spent these days watching movies or TV. I feel it doesn’t do me any good to tell myself I’m going to play a game later on knowing I’m probably not going to bother. It’s a pointless expectation to have if my interest isn’t there when the time comes. Now don’t take me as one of those “I’m done with gaming” types. That’s preposterous. It’s much more along the lines of “absence makes the heart grow fonder” things. Time away from playing games will ultimately help me get more excited to play them. In these last two months I did play and beat Jak 3 (PS2) and Uncharted 3 via the Uncharted Collection on PS4. The former was fun until the final boss. Trying to shoot specific spots without any sort of auto aim in a vehicle that only shoots straight ahead is not what I call fun. The latter was fun and Drake was a wonderfully voiced character as always, but the constant big set piece escapes from crumbling structures got old very, very fast. I also played some of the RPG Star Ocean: First Departure on PSP. It was fun for about 5 hours and, as usual, I lost interest. Rarely does an RPG keep me entertained these days. I do want to eventually finish The Legend of Kage 2 (DS) and Bully (PS2), but those will have to wait until my gaming mojo returns. In the meantime, I’ve watched A Clockwork Orange and was surprised how much I enjoyed it. The scenes you usually see about the movie are from the beginning section and that never convinced me to watch it. However, a breakdown of the movie via Renegade Cut showed me other parts of the film making it much more intriguing. This is something you simply cannot accomplish for me by avoiding spoilers as the Internet community would have you believe. A Clockwork Orange was an excellent piece on society’s view on criminal punishment and rehabilitation. In that regardless of debt paid while incarcerated the victims still want a piece of payback for themselves. It’s actually quite sad and makes Alex, the main character, sympathetic by the end. At the end, though, it seems as if Alex reverts back to his old ways. Is this the case or am I reading more into it than is there? Finally, I’ll leave you with my new acquisition of Painkiller: Hell & Damnation. Thanks for reading! Hi, there folks and fans of mine. It has been a difficult thing as of the last few weeks to get real content updates here which includes the big shows of the Hart & Usagi Podcast and the Space Suplex podcast. As of the previous update I had mentioned a friend had suggested I try a controller card for my troubled PC. This would bypass the SATA ports on the motherboard to see if that helped in solving the problem. It unfortunately didn’t. The next step in this trial and error circus was to try a new power supply. The idea here was that maybe the original one was not providing full power to every component of the PC. Did this end up working? Say it with me: Of course not! At this point I was fed up with this ongoing nonsense. I decided to pack up and return all three of the new computer components I had bought to try and fix my PC. This included the first item, a video card bought locally. The controller card and the power supply are on their way back as we speak. So what is the solution to my PC problem, you ask? If you figured out I went with a whole new rig, you’d be considered a smart person. It’s basically the same system with slightly better parts over my out of order computer. I even got the exact same case again, which was probably my favorite part of the last system. One quick update I can give is that I’ve recently been playing Uncharted 3 via the Uncharted collection of the PS4. I’ve been enjoying the character banter more than ever before with this entry in the series, but some of the puzzles have been convoluted and lame. Regardless, it’s been fun overall so far. Check out my Backloggery page for more playtime information. Thanks again for reading and game on!